I love a themed party light. I can’t help myself. But I hate that they are a dollar a light or more. They only come in strands of 10 or 12, so you have to have so many strands to have much of an effect. Plus, if you’re living in Israel, 4th of July party lights are not exactly easy to find. So here’s a way to make your own party lights. To make my party lights I used my new favorite multipurpose craft supply: fused plastic. This is the easiest upcycle and even though you’ve probably seen a million tote bags made from this stuff, you can use it for so many other purposes. 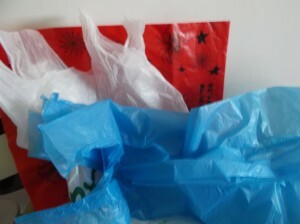 Here’s how to fuse plastic: First, collect a lot of plastic bags. Any kind will do, but different bags are easier to work with, so you may have to experiment. Keep an eye out for fun colors from different stores. I happened to have this red bag that already had fireworks and stars all over it so I knew that would be cute and funky. To add interest to my other colors I used a layer of bubble wrap, which gives a polka dot look. Set your iron on a medium high setting. Then layer your plastic bags at least 3 or 4 layers thick. Too few layers and you will burn through; too many and they won’t stick together. I cut off the bottom of the bags and top of the handles so the bags lay totally flat. Lay a piece of paper over your plastic and press it while continuously moving your iron. I like to use a heavy tissue paper or just plain typing paper. Press in sections until you’ve fused the whole piece. Flip the plastic over and press it again from the other side. Your paper may stick a little, but have patience; it should peel off once it’s cool. Sewing. Don’t freak out. You’re going to be OK. I printed off a simple star from the internet and used it as a stencil. I cut out a whole bunch of each color and started folding. 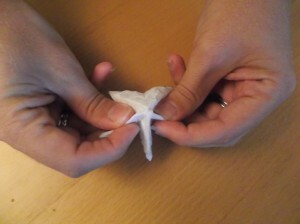 To get a 3D effect, fold each point of the star in half and pinch it together sort of like you would those ever-popular fortunetellers you made in 4th grade. Here’s where you may get intimidated. I sewed. A lot. Don’t freak out. You’re going to be OK. If you want to do it like I did, I used embroidery floss and a simple whipstitch to sew two stars together, leaving a little space to poke in a twinkle light. I liked the baseball effect the stitching gave. If you don’t sew, or just don’t want to sew, try a little hot glue (be careful though). This would be a good project for older kids especially kids who want to learn to sew. I do use a thimble because it’s a little hard to push the needle through the plastic layers, but other than that, this is the same level of sewing as your average wallet made at summer camp. Have fun and have a very happy Independence Day! Kathryn Powers is a native of the Oklahoma Panhandle. She received her bachelor’s and master’s degrees in English literature from the University of Oklahoma and Georgetown University respectively and like many English majors, is not currently utilizing any part of her education. After a brief stint as a high school English teacher, Powers married and followed her husband to Beersheva, Israel where he is studying medicine and she is struggling to buy the groceries, do the laundry and pay the bills all without a working knowledge of Hebrew. Powers is a long time crafter, sewer and general project starter. She, her mom and her two sisters have been known to sweep into each other’s lives, start ten projects, finish two and then quickly disappear leaving only a trail of yarn, glue and ribbon. Powers is an avid and indiscriminate TV watcher, sometimes baker, and dog-less dog lover. She thanks her husband for his everlasting patience with her craft mess. Contact the author.